Here’s another “picking up stitches” tutorial, folks, and this time there’s good news and bad news. The good news is, this time it’s got sound, so you get some commentary. The bad news is, ahem, this time it’s got sound… You see, there’s just one small thing I should warn you about: we don’t have an external microphone, so the words are kind of muffled. But that’s not all bad, when you consider that if you turn the volume up you get my prissy Anglo-New Zealand “anyone-for-tennis have-another-cucumber-sandwich-vicar” accent. (We tried to get Morgan Freeman, honest we did, but he only does Honiton lace voiceovers now.) Anyway, see what you think. The first sleeve is successfully finished, including all six inches of cuff, and I’ve picked up the stitches round the armhole and embarked on the second sleeve. And as usual, I have no recollection what I did last time, and can’t make sense of my notes, so it’s rather more stressful than necessary! The services have been agreeable enough, so yesterday we thought we’d stay after for the “coffee and conversation”. But oh dear! It was essentially like being at a party when you don’t know anyone – and, like I said, brought back many happy memories of the discos of my student years (encapsulated brilliantly by The Smiths: “So you go on your own/ And you stand on your own/ And you go home and you cry/ And you want to die”). Lesson One: How To Stand and Nurse Your Coffee and Not Look As Though You Mind Being Utterly Ignored By Everyone in the Room. Still, I’m not a shy 19 year-old any more, so I decided to be proactive and break the ice. Ah, when will I learn? There was only one person in view who didn’t have their back to us, a woman, so I went up and introduced myself. Alas! She turned out to be a former member, now a born-again atheist, who had only come this time to meet someone (who hadn’t showed up). She responded briefly to direct questions (rather like a spinster aunt who’s had the children dumped on her for the afternoon despite protesting vigorously, and it’s raining outside), preferring instead to stare past my right ear in silence. But like two colliding galaxies locked together in a death-grip by gravity, once we’d moved closer it seemed impossible to break free, held together by the recently-discovered force which binds the universe together, and which scientists have identified as Social Death – and so I gulped down my scalding coffee while she counted the cracks in the ceiling and so the long morning wore on, bringing the peace of the grave a crucial few minutes nearer. The Intimidating-Looking Woman: Hello, I’m Clare. Me (relieved, thinking, maybe this isn’t going to be so bad): Oh, hello, I’m Gordon. The Intimidating-Looking Woman (crushingly): No, I mean I’m the archivist of Clare College, Cambridge. By which point she’d obviously written me off as a total loss and didn’t speak to me again throughout the meal. And after a social annihilation on that scale there was nothing for me to do but resign from all my clubs and go and join the Foreign Legion, a crushed and broken man. Never mind! The sun is shining and in a few days it will be Easter. And if I can’t find solace in religion, I can at least turn to the greatest balm and comfort known to man, chocolate Easter eggs. And I think we can all find it in our hearts to say, Amen to that! A very Happy Easter from Gordon and Margaret to all. Wow! That was really good. Hmmm I not sure I get what you are saying about the ratio of rows to blocks. I have to listen again. This is helpful to me because when I am picking up stitches for a sleeve, I am alway behind or in front and have to invariably go back and re-do because I have either too much or too little room left to complete the required number of stitches. Cudos to the camera person. The closeups are great! The point about the blocks is, if I’m not careful I naturally pick up one stitch for every row around the armhole – but since I knit 12 rows to the inch vertically, that would equate to 12 picked-up stitches. And since I have a stitch gauge of about 9 stitches to the inch horizontally, not 12, I would end up with 3 extra stitches for every inch, which would wreak havoc with my pattern and spacing. Now, because I am naturally unobservant, with a mind that wanders off on its own at the least excuse, I find i need visual clues to help me keep my spacing roughly even on the pick-up row, since I don’t check every inch. So I look for visual markers, or blocks, in the yoke pattern on the body, especially if it’s divided into panels, like this one is. In this case, I was picking up approximately 90 stitches along each half of the armhole; and there are 3 panels up the yoke. So it’s simple to divide 90 by 3 to get 30 -I just need to make sure that by the end of the first yoke panel I haven’t picked up more than 30 stitches. If I have, it’s easy to fix – just pull them out and do it again – but I’d rather not have to! I don’t think each inch of the armhole has to be exactly 9 stitches, either – so long as over two or three inches you’re about even, it will look OK when it’s done. Gansey knitting is very forgiving, it’s so fine no one will ever notice! I hope this answers your question – let me know if not. I can see your delemma with the pattern you are doing and trying to keep your blocks of pick-up stitches to correspond with the other sleeve. When I pick up stiches, I can’t trust that it will be even without marking sections with T-head pins every two inches after doing the division math for these sections. In the progress of my own gansey, I have successfully joined the shoulders with the 3-needle bind off AND ! have done the neck ribbing with two circular needles instead of the four dbl.pointed needles! I loved not having all those pokey-parts jabbing my wrists while circling the drain! I’ll do the same for the armholes. Great job on the video with sound – you should post it to You Tube. Happy Chocolate Easter Bunny to you. Well, obviously you’re in the black belt/ninja zone! Congratulations. I have certain points I try to align consistently – so on this gansey, the central cable should be exactly in the middle (i.e., top of the shoulder) on each sleeve. But “close enough for jazz” is my new favourite phrase, and I don’t mind a certain amount of imprecision (another reason why I don’t give classes). The way I explain how many stitches to pick up along an edge is to explain stitch gauge. If there are 5 stitches to an inch of knitting, then for every inch of width that you want to pick up along, you’ll need 5 stitches. So, if you have to pick up along an armhole edge that’s 20″ around, you’ll need to pick up 100 stitches. Five stitches in each inch along the edge. Sometimes people mark out the inches, sometimes people wing it (I’m a wing-it type, myself. ), sometimes people end up with vests. The gansey is rushing right along! Ha, lint – I wish! It felt like being a ghost that people could only see intermittently and immediately discounted. (Just bad luck catching the wrong person at the wrong moment, of course.) I’m essentially an introvert who can do a good impression of an extrovert when the need arises – but when, as in this case, it misfires, I tend to revert to type and lose interest fast. Well, in a silly way, it IS possible to be interested in lint. I mean, there are so many different varieties and a plethora of origination options for lint. … and I’ll just leave you with that image. Have a great Easter with your family. I hope you all get lots of chocolate. We’ll have to remember to stop into the British Store to get chocolate eggs. Not to belabor the point, but… wasnt there a story on one of the US news shows about a woman who used the lint from her clothes dryer as an art medium? If you looked in the dictionary for the word “introvert,” yes, you would find my picture as a prime universal sample. Would it be safe to say, based on what I am seeing here, that being introverted is the norm and being extroverted is stepping way out of the box for most people. In the olden days, prior to radio, TV, computers, etc., people had to communicate by either letter/telegram or face to face and that takes quite a bit of training in communication and/or deportment. I think this is a skill that is quickly disappearing. Having to speak to someone face to face or in front of a group is almost tantamount to confrontation, and what introvert likes confrontation or its more amiable cousin, negotiation? I think they have schools for this problem dont they, or was this something we were supposed to learn in kindergarden? P.S. Gordon, waddya mean you’re going to be galavanting in the Midlands? Where’s your laptop? Where’s your Blackberry, IPad, Iphone etc.? Maybe a microchip implant is the way to go? LOL. Have a safe trip. P.S.S. Where is the Midlands? I’m not sure that introvert is the norm. I see lots of people who talk to strangers and hang out in clubs and are happy in social situations. I think that groups often self-select, though; extroverted people end up in extroverted places and situations. I’ve never had problems speaking in front of a group (one on one can be anxious, especially at first, but once I’m rolling, I’m good), but again, I’m both extroverted and an extravert – I gain energy from interaction with people rather than from spending time alone. I do think that … well, certainly Americans aren’t being taught the social graces. I see the way kids treat each other, and strangers, and clerks in stores and I cringe. Unfortunately, this doesn’t seem to be something they’re doing un-taught. It seems to me that my generation (I’m 40) and the one just before it are … less polite than my grandparents’ was. Um. I’m curious about something unrelated to interpersonal relations, though. You’re working on a gansey as well? Are there pictures? I’d love to see! ACK! It’s Lynne who’s working on the gansey and not Leigh. That’ll teach me to speak without checking. Lynne, thanks for the tip on using two circulars on the neck and sleeves!! I used a small circular on my sort-of-gansey’s neck and started a sleeve that way, but it didn’t take very long on the sleeve before the circular was too short. I tried DPNs for a few rounds, but the metal ones are too slippery and the bamboo is too sticky. The double circulars is just the ticket. Gordon, try it, you may like it! The video is very well done; many thanks to you and Margaret. SongBird, I’d be glad to share a photo if you want to post your e-mail. I’m working with a burgundy colour Frangipani. Dave, I’m glad you tried the two circulars – it’s my first time and I’m really impressed with how much faster the sleeve is going – and NO ladders! My friend does socks this way but she suggests to stay with 24″ (60cm) instead of trying with shorter circulars. Lynne – my email address is songbirdgifts at gmail dot com! I can’t wait to see the pictures. I use two circulars for almost all of my in-the-round things. Hat tops and glove fingers are two of the few things I don’t use two circs for! Wrong “Leigh” notwithstanding, I agree completely. I think whether you are an In-y or an Out-y (as in outgoing), it think we will all find that environment that we are most comfortable. Stepping out of that comfort zone, without practice of a skill you dont inately have, is the scarry part. Those “practice runs” always come back to haunt me as I end up doing or saying something completely ridiculous! Perhaps that is why I like to knit. It is an I-team sport. P.S. I sure wish I did have a gansey on needles to show you. Too much other going on. Hope you’re having a pleasant time in the Midlands, at least it will be a few degrees warmer than Scotland! 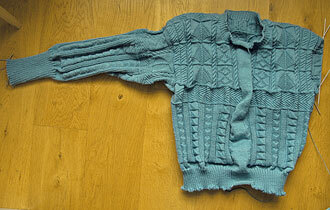 Good news – I’ve finally planned (well up to the armholes, anyway) and cast on my Other Half’s Christmas (2011) gansey. Thanks for the inspiration, and I rather enjoyed the admiring glances when I bought the circular needle for the project and told them what it was for. “You’re using proper gansey wool? Wow!” Feeling rather smug now, no doubt it will wear off in the months of knitting to come for a rather large man-sweater. Just to complete the story, here’s a page on making paper with dryer lint. Ok -this will be a blast from the past. Thank you for your generous observations about my book which I wrote all those years ago. You are very lucky to have a copy because it was published just as van nostrand was being subsumed by God knows who and USA only got 3000 copies. Dear Dover has negotiated its reprint to include some fine tuning which of course would include the observations you have made. Plus I have asked Elinor Brown, and Meg Swansen for a couple of nice thoughts for the back page. Would you do the same? I am also after some quick info. vis a vie what yarn are you using? and what on earth has happened to the explosion in our sizes!! After fixing the mistakes and coming clean on Aran my expanded edition will centre on the last paragraph in my forward -retain its graphic format -include full wording in many more patterns- high definition printing- more detailed discussion on design generation -structure -colour etc -some thoughts on the impact my book had -including me! so I can claim a right for my narrative to be included in the larger picture of the tradition. And all exemplars of design and technique will be work done by past participants in my workshops. To answer the elephant in the room – I was invited to Australia -where I met my wife who was a participant in one of my workshops. I had the operation and became an Australian! and 40C is not the best place to earn a living knitting. So I became an academic specializing in constructivist student centred learning in the context of design studies. Now – I have retired -and this has come along. life is good. Mr. Pearson could you tell us when your book is going to be re-published? From someone who searches the “stacks” for you constantly. I was one of the lucky ones to get a copy of your book in the U.S. and it’s sitting in front of me as we speak. Some of the best Merino yarn I ever knitted up came from Aus! Michael, your book is a gem, even if there were a few errors, you did a great service to Britsh craft knitting. I believe I found my (used, “near fine”) copy on AbeBooks. It was a surprisingly reasonable purchase (lucky that day) and came from a bookstore somewhere in Devon. I greatly look forward to seeing the new edition. Great work, Michael Pearson, and go Dover! Your ‘get in touch” does not work. I hope you had a chance to catch the Met’s “Live in HD” last weekend of “Die Walküre!” Superlatives keep running out…it was that great!